A graceful, branching tree - what keeps it reaching ever upward, constantly renewing? In the heart of this delicate silver pendant is the message "you are loved" - a reminder to keep your spirit looking up. Sterling silver two-part clamshell pendant, enhanced with the glow of a tiny garnet bead. Approx. 3/4" diameter, on 18" chain. Handmade in USA. Chain could be a bit longer. That said, my wife was quite taken by this "beautiful birthday present" (her own words)! 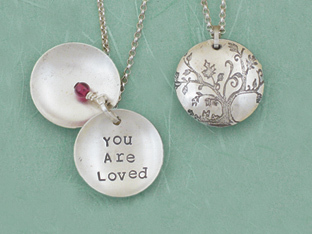 Unfortunately, I don't think the "You Are Loved" necklace looks as it is pictured. In fact, if the catalog had photographed the pendant I received, I don't think you would be able to tell there is a tree on the front. It is such a faint engraving, especially the left side of the tree, that I questioned whether I should give it to my daughter for Christmas. Owner Response:Thank you for your review, Barbara! We're sorry that you're disappointed with this item, and are always happy to assist with an exchange or return if any of our products do not meet your expectations; please give us a call at 800-207-4256 if we can help. This is a delicate piece, very beautiful. Great understatement of love, gave it for Valentine's and it was loved! A birthday gift for our daughter - she loved it. I didn't find the piece overly flimsy. I feel it will be fine. The chain is a good chain but it is supposed to be 16" and it is actually 18". I have a very small neck and 18" is too long. If I had known it was not what they said, I don't know if I would have ordered it. Also, disappointed in the small garnet. Almost looks black, not like the picture. Owner Response:Thank you for your review, Wendy. We apologize for the incorrect chain length noted in the description; we have corrected that to read '18"'. Bought as a present for my teenager. She loves it a lot.